The bacon and the butter help to keep this rotisserie chicken moist and give it an old world fire roasted taste. A simply delicious, few ingredient meal! Sprinkle the inside of the chicken with the salt and pepper. Truss the chicken. Place securely on rotisserie skewer. Dry thoroughly with paper towels. Rub with butter and sprinkle with salt. Blanch bacon in boiling water for three minutes. Secure the strips of bacon over the breast and thighs with string. Preheat your grill and prepare your rotisserie. Place a drip pan under the place where the chicken will be and fill it half full with water. Keep water in this pan during the cooking time. Place chicken on the grill with a medium heat. Cook until dark meat (thighs) reaches 165 degrees F/65 degrees C, about 2 to 2 1/2 hours. 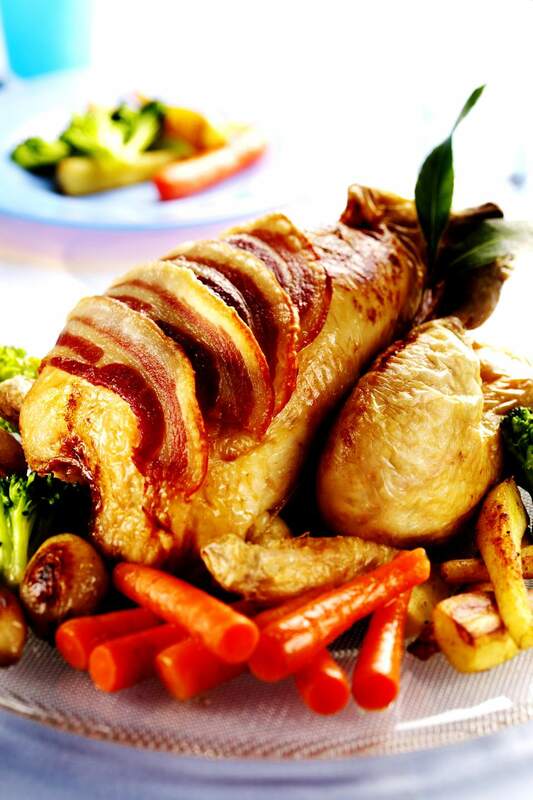 Remove bacon about 15 minutes before the chicken is done and baste the chicken with drippings from the pan. See how to Rotisserie Chicken - Step by Step.